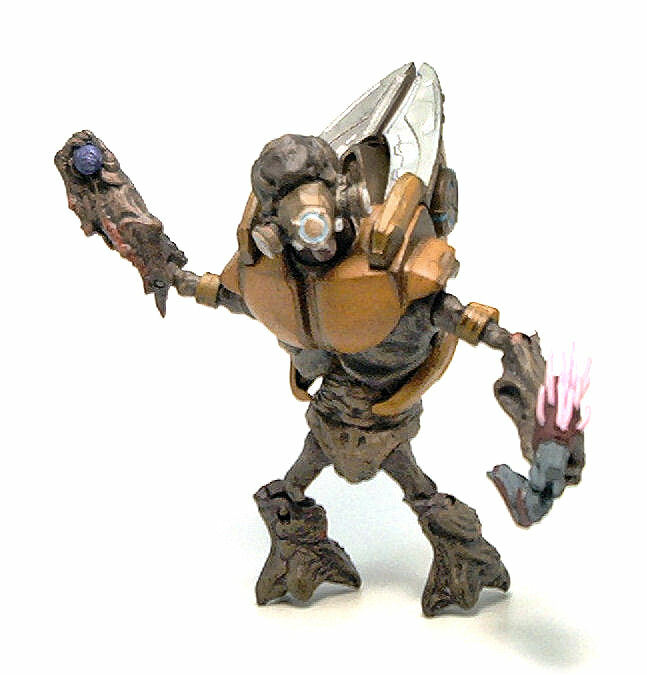 In the Halo games, Grunts are a type of enemy you’ll see a lot of. Individually, they are not much of a challenge, but in the presence of a leader-class character and in sufficient numbers, they can be quite dangerous. Following the Covenant rank system, most of the Grunt troops are labeled as Minors and are easily identifiable in the field by the color of their gear. 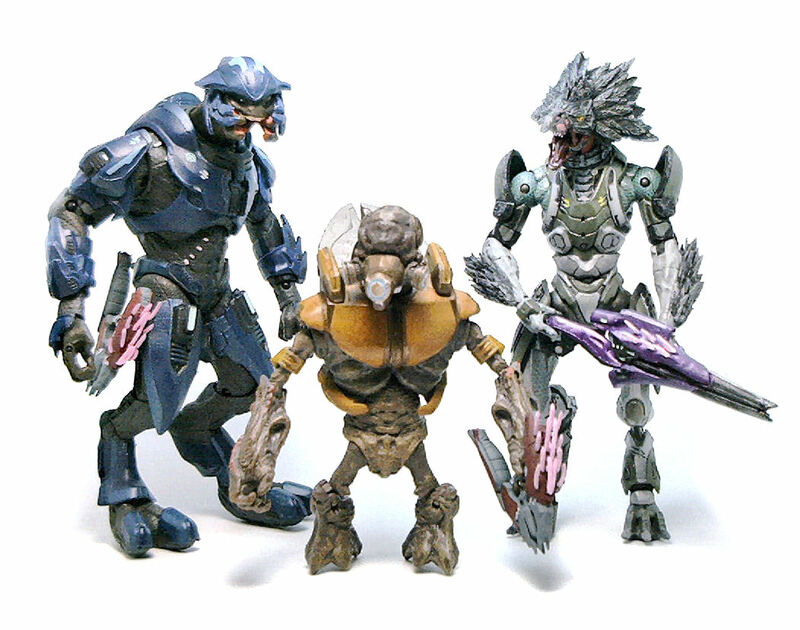 Of course, McFarlane Toys had to include them in their Halo: Reach line, even though they are not necessarily as visually formidable as the other Covenant aliens or their human enemies. 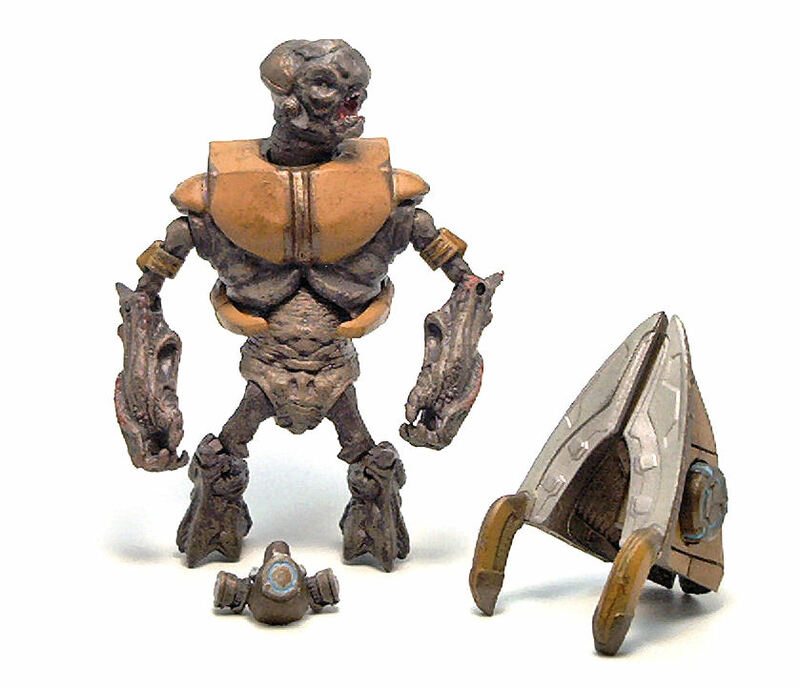 However, the Grunt Minor was not a part of the first series of figures, but instead being released in january 2011 as part of Series 2. Grunts are squat, bulky creatures that share mammal and crustacean traits for a thoroughly unpleasant appearance. They seem to amble around naked, except for a cumbersome piece of gear that combines upper torso armor with some sort of autonomous breathing apparatus. The organic bits of the figure are sculpted with a pitted texture that reminds me of pebbles and crab shells, while the artificial bits look rather steampunk-ish. 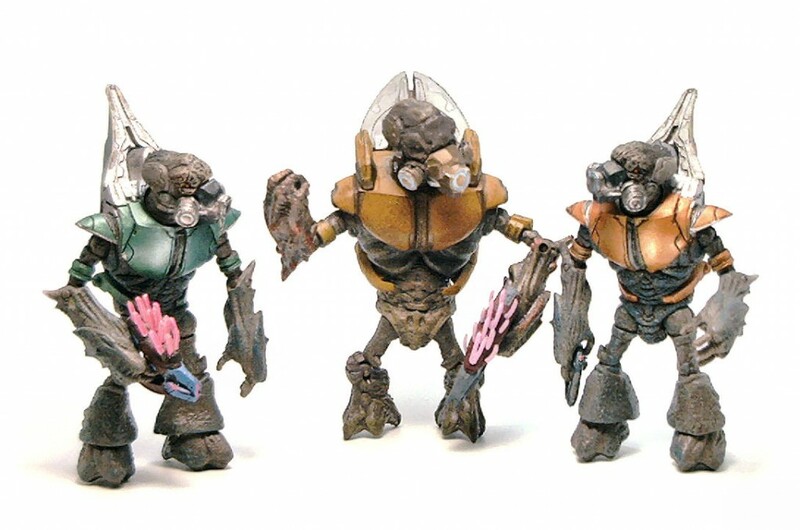 For the Halo: Reach line, Mc Farlane Toys developed a new mold for these Grunt Minors, introducing several changes to the design of these creatures. 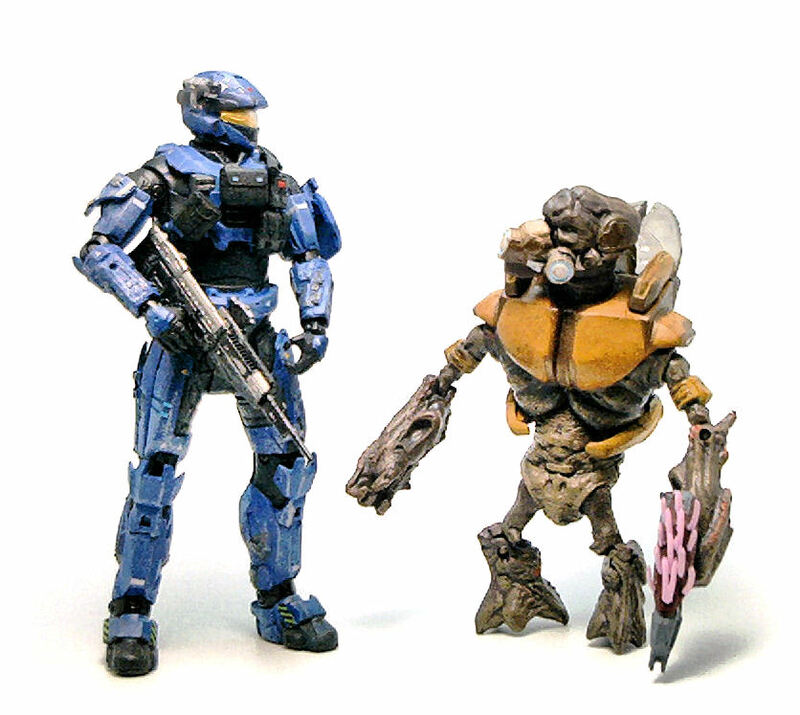 Scale is the primary difference, by about 10% of the Halo3 Grunts size, but also, the joint design was simplified, meaning we get significantly less articulation than before. This is a considerable reduction in the number and complexity of the joints these creatures used to have back in the Halo 3 days, but I have to admit this articulation spread works. Some of the joints, like the hips are not terribly useful for riding vehicles or achieving ultra dynamic posing but given the increased mass of the upper body, the joint design actually provides enough stability for the Grunt Minor to stand upright. 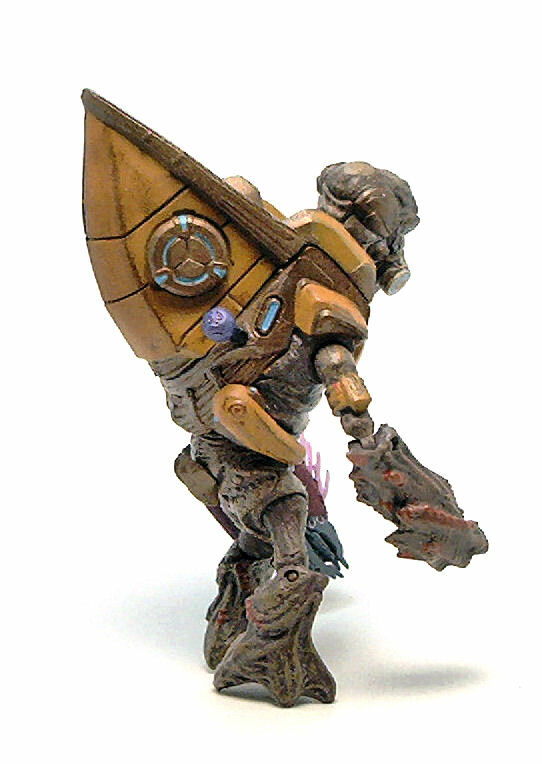 Like most of the figures McFarlane does for the Halo license, the Grunt Minor mold is designed to be modular, thus the mask and the “backpack” on his back are removable. Additionally to this pieces, the Grunt Minor comes armed with a weapon that in the game fires pink crystal needles that home in on a target an explode after a few seconds called a Needler and a plasma grenade. Both the grenade and the needler have pegholes on them that fit the single black plastic peg provided, but only the granade can be attached to the back of the Grunt Minor using the empty holes at the sides of the gas tank. Even though the Grunt can hold his needler, one annoying aspect of the way McFarlaner designs the weapons (specifically the Covenant ones) is that it is usually a chore to get the figure to grab them in the first place. It wasn’t all that difficult a task to get the Grunt Minor to hold his gun, but it would be much better if they took some liberties to deviate from the digital models used to develop the weapon molds and make the grips more functional. The paint job on these Grunt Minors is decent, although not especially impressive. The organic bits have a shading wash that helps in bringing out the texturing, while the technological bits are painted in a muddled metallic orange hue, with a few details picked out in silver and dull brass paint. The face of the creature is well detailed, from the silvery eyeballs to the inside of the mouth, which has painted teeth and tongue. Overall, it is not easy to feel excited by this Grunt Minor. 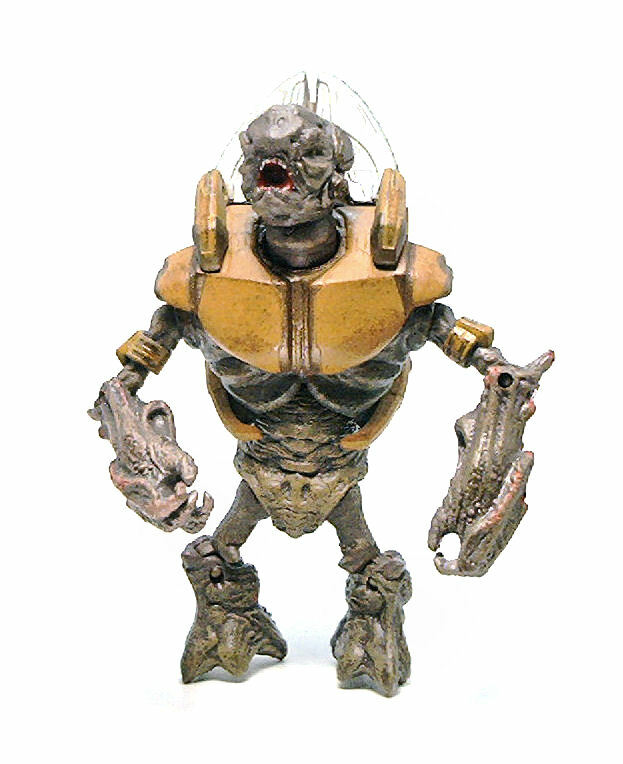 In a line rife with more interesting character designs the Grunt Minor excels at being entirely unremarkable which, in a way, must be some kind of success. The best that I can say about this Grunt is that it is a reasonably well-designed toy. I still like better the old Halo 3 Grunts but these new ones are not a bad acquisition if you can find them at a discount of 50% Off or better.